The much- anticipated Avengers: Age of Ultron is back facing a bigger and more dangerous villain, a new battle for the heroes. For this contest, I am teaming up with my Flanax Family to give my readers and followers like you an exclusive screening of Avengers: Age of Ultron. 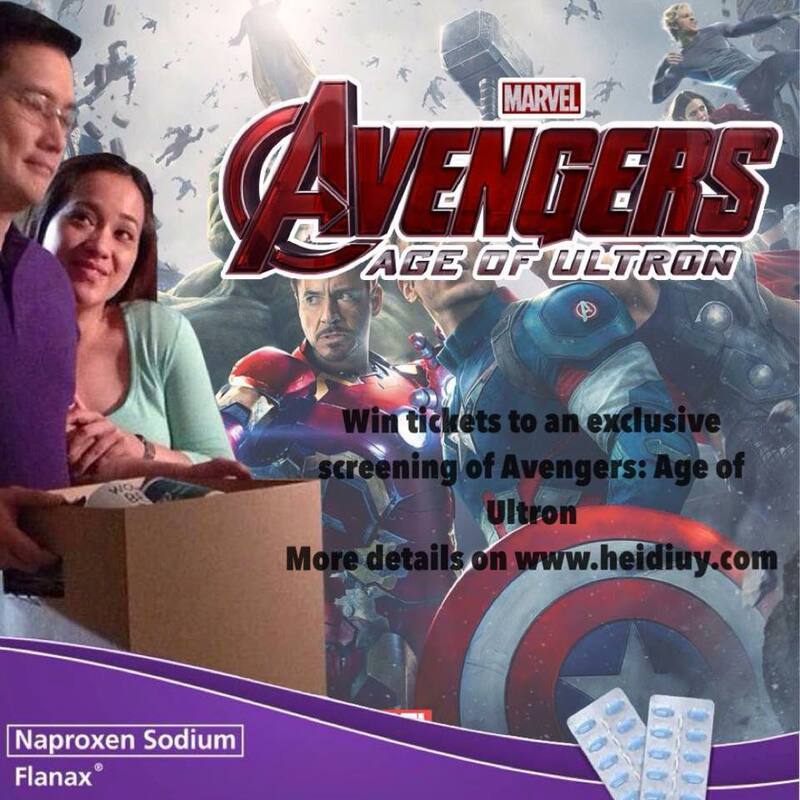 We will be giving away 20 special screening tickets of the Avengers, Age of Ultron at SM Megamall on April 25. We will be selecting randomly, 10 winners of 2 special screening tickets each. Like Flanax Philippines Facebook page. Make sure that your account is set to public. Good luck! One (1) like is equivalent to one entry, One (1) Facebook Profile is entitled to submit one entry. All winners will be announced on April 20, 8PM. The 10 lucky winners will be posted on my Facebook, Instagram and Twitter account. Flanax will also announce the winners on its Flanax Philippines Facebook page and will be contacted via email not later than April 20, 2015. Prizes can be claimed on April 25, 2015 at SM Megamall Cinema. Full details of claiming shall be sent, no later than April 20, 2015. Employees of PurpleBug, Inc., Taisho Pharmaceuticals Phils Inc. ,and their relatives up to the third degree of consanguinity and relatives of affinity are disqualified from joining. Taisho Pharmaceuticals Phils Inc., its affiliates and subsidiaries shall not be liable to the participants in contract, tort or negligence or otherwise for any loss, damage, cost or expense of any nature whatsoever incurred or suffered by the participants and which is of indirect or inconsequential nature, including without limitation any economic loss or other loss. Taisho Pharmaceuticals Phils Inc. is neither accountable nor responsible to any legal liabilities brought about by the misbehavior of the winners and/or his/her/their companions while they are availing of the prizes.